What happens when two friends take an interest in an oak tree? They begin to notice more about the world around them, such as the seasons changing and squirrels making homes. They are inspired to do independent research, from studying acorns to looking up scientific terms, and to be creative by composing pictures and poems. And they discover new things, such as their tree’s structure and characteristics—all because they stopped to look around them. As warm and dreamy as a summer day, Our Very Own Tree will inspire readers to seek out their very own places in nature. 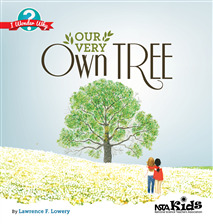 Our Very Own Tree is part of the I Wonder Why book series, written to ignite the curiosity of children in grades K–3 while encouraging them to become avid readers. These books explore the marvels of animals, plants, and other phenomena related to biology. Included in each volume is a Parent/Teacher Handbook with coordinating activities. The I Wonder Why series is written by an award-winning science educator and published by NSTA Kids, a division of NSTA Press.